In person, the 1st half of this game was one of the more exciting games I’ve watched. However, I’ve never wanted a 2nd half to end more than I did this one. There were great plays throughout, but the 1st half definitely outweighed the 2nd. Let’s see how it translated to the TV. The music guy at Auburn must have been listening to me a few weeks ago. They stopped the pre-kickoff techno in time for the Waaaarrrrrrr to get good and audible. LSU’s freshman QB Brandon Harris tells the Auburn crowd to get louder just before he takes his first snap on the road. He fumbles on the next play. Luckily for him his fullback recovered, but the purple Tigers go 3-and-out. Slow down, young man. Quan Bray has given the Jordan-Hare crowd reasons to to think that every punt is going to be taken to the house. You can tell from the buzz when the ball is in the air and cut he makes. Auburn’s first play is a designed quarterback draw up the middle. It worked every time it was run in this game. Let’s keep running that. The referees do not call pass interference on Duke’s defender on the first drive, but you’ll see it inexplicably called multiple times later. Daniel Carlson hits his longest FG of his Auburn career (46 yards). 3-0 Auburn. ESPN comes back from commercial showing Jordan-Hare cheering for the Alabama loss. At that time I gave a little smirk, but we had a game to win. LSU didn’t convert a single 3rd down all night, but I bet 99% of their 1st down runs went for 5 or more yards. The defense shut it down on 2nd, 3rd, and 4th. The zone read game was still a tad bottled up on the first few drives, so Gus put the ball on Nick’s arm… and WOW, how did Sammie catch that ball? He’s not even fully healthy, but he’s still a beast. 10-0 Auburn. Brad Nessler says this is the loudest he’s ever heard Jordan-Hare Stadium. I saw some tweets saying that the loudness registered higher than last year’s Iron Bowl. I mean, it was loud, but I don’t know about that. Auburn runs a quick snap/pitch to Cameron Artis-Payne on their next drive. I didn’t go anywhere. Corey Grant scores a touchdown the next time it’s run. Oh, here’s Jeremy Johnson, and that was Bray at wildcat. In person I thought it was Nick. So… wildcat to sweep to Grant to flip to Jeremy to deep pass to Sammie. Boom. Then CAP runs for 3, then CAP runs for 10, then Nick jukes everybody to score his first rushing touchdown of the night. Mad LSU fans are mad. 17-0 Auburn. Leonard Fournette comes in and gets LSU’s first 1st down of the night. Is LSU the only team in the nation that does the flip-dive play (tossing it to the running back and he runs it between the tackles)? They run it a ton. Oh, the freshman chunked one up after decent coverage and our guys were just a step behind. Ok, we’ll give them one. LSU scores on the next play, although Kris Frost came across the line and almost made the stop by himself. 17-7 Auburn. 3rd-and-9 and Nick throws a ball where only Duke Williams’s fingernails can catch it. Might be the catch of the night. And the passing game opens up a huge hole for CAP, who is caught from behind around the 10-yard line. 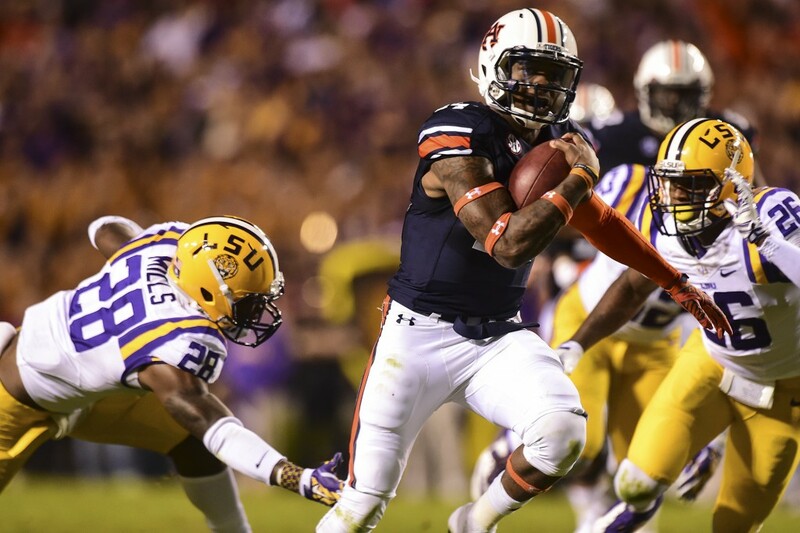 Auburn gained 247 yards in the 1st quarter which is the most ever under Gus Malzahn. We’re playing LSU. Bo Jackson is kneeling at the goal line. The greatest athlete of all time, kneeling, on a towel, just watching the goal line. That’s more intimidating than LSU putting a tiger in a cage near the visiting team. I saw the wide open touchdown pass to CJ Uzomah from a mile away. I said “boom” before he even threw the ball. And then CJ does the Lutzie and everything is awesome. 24-7 Auburn. 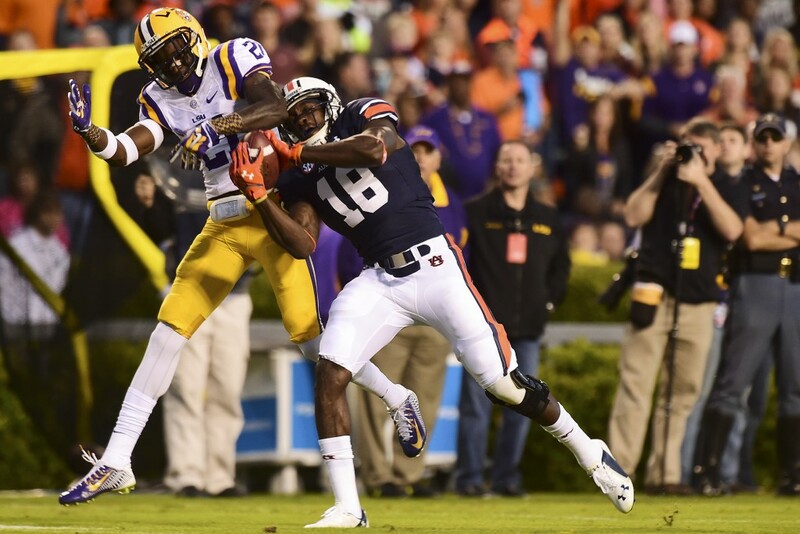 If Brandon Harris could keep a pass under 10 feet in the air, LSU could’ve maybe converted a 3rd down. An ESPN graphic shows that Jeffrey Whitaker was the only player on the current team to beat LSU (2010), but Trovon Reed was technically on the team then, too. The running game is starting to look like 2013. There are real, live holes to run through. LSU faces another 3rd down and the music guy plays “It’s Goin’ Down” again. Don’t mess with perfection. The purple Tigers are stuffed again and you can see Les say “we gotta throw it.” Sure, try it. Yeah, you go for it on 4th down on the 50, Gus. Oh, just taking a delay of game to punt. That was not targeting on Nick Ruffin. Not at all. He hit with his shoulder. The receiver came down right into where Ruffin was going. It looked ugly because his head snapped back, but his shoulder hit mostly on the chest. There was no way to stop it. He did not launch. He didn’t leave his feet. He didn’t lead with his head. It was not targeting. Kris Frost is becoming my favorite defensive player. Aside from him finding the ball on every play, he just tried to hurdle over a lineman. It didn’t work, but it looked awesome. Following the first sack of the game, the offense clicked about as hard as you can click for about four plays, then sputtered, then Nick Marshall did his best Cam Newton against LSU impression. Seriously, it was almost the exact same run minus about 20 yards, all the way down to accelerating inside the 10 yard line to being tackled across the goal line. 31-7 Auburn. Oh, and there’s Bo celebrating… and WHY IS THE EASTER BUNNY BEHIND HIM?! WATCH OUT BO! Actually the rabbit was part of an Aubie thing. Aubie was dressed as a carrot and they went around the stadium fighting. Aubie won. Brandon Harris makes one of the two positive plays for LSU in the first half on a long scramble, but Les’s clock management mixed with good coverage on a desperation pass at the last second ends up with no points for purple Tigers. Lou Holtz called Bo Wallace “Boo Wallace” during the highlights of Alabama losing to Ole Miss. Rece Davis says that Auburn will be ranked #2 when the polls come out. For a second, I thought I had accidentally fast-forwarded the DVR past the game. 31-7 will make a guy say that, though. I’ll go ahead and tell you right now, this 2nd half isn’t going to have much commentary. Auburn was running the clock out from the 2nd drive in the 3rd quarter on. Todd Blackledge says it will devastating mentally to Brandon Harris if he’s taken out of the game. I guess we’ll see. The defense was the story in the 2nd half. They sack Harris, stuff “Heisman-candidate” Leonard Fournette, and stop a QB draw all in the first drive of the half. Seriously, Auburn is running the play clock down with 9 minutes left in the 3rd quarter. Against LSU. Dang, Duke almost had him a touchdown, too, but good coverage by the LSU defender. He tried to come out of the game, but Dameyune got on him to get back in. It didn’t show on the broadcast, but in person he got on him hard. Carlson hits his second 40+ yarder of the night. 34-7 Auburn. Dang, Auburn’s defense is good, freshman QB or not. Ok Nick, you can have one mistake. There was some confusion who was keeping the ball on the zone read. Fumble. Oh well. And now Jennings comes in to play QB for LSU. In person, I didn’t realize it until midway through the 4th quarter. I’m observant. Different QB, same LSU offense. Even trying all four downs to do something. Nope. …that ends in a near interception on 4th down. Fans “awwwww”d because Trovon dropped the pass at the 2-yard line. Um, it was 4th down. We want the ball at their line of scrimmage. Dummies. Corey Grant is fast… and scores Auburn last points of the night on a quick flip. 41-7 Auburn. Dang, Auburn’s defense is good, different QB or not. 4th down stop inside the 15 to keep the 2nd half shutout. And the scrubs are in. Jeremy Johnson, Roc Thomas. Such scrubs. Roc Thomas always looks like he’s about 1 step from breaking a long one. We’ll see it many times one day. That’s it. Final. 41-7 Auburn. That was a beating. 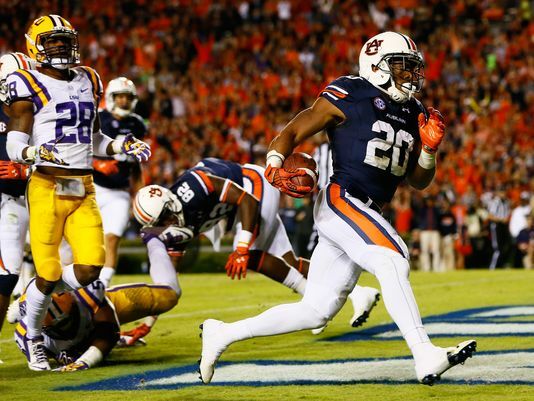 For the first time in a decade, Auburn gave LSU the beating they deserved. This may not be the same LSU team as years past, but it’s still LSU. They still have talent. They still have voodoo on their side. None of it worked, though. 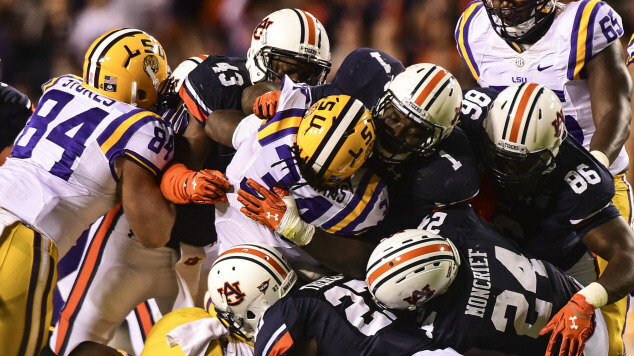 Auburn dominated every single facet of the game. They dominated 99% of all plays in the game. The offense clicked. The defense was smothering, The kicks were long, hard, and through the uprights. It was a near perfect performance, and it was exactly what Auburn needed to get out of the perceived funk that had been hanging around since the Kansas State game. There is no question that, right now, Auburn has played the best of any team in the nation. They have played and defeated teams at home and on the road like a champion would. They still have the toughest schedule in the nation to follow, but they are the one team that looks like it can take it. Gus is the one coach that can guide his team through it. I believe Auburn can do it, and love it.